Payments for your website, mobile app or marketplace with no chargebacks, ever. With no minimum fee and priced as low as 0.89%, the Escrow.com Platform API is cheaper than credit cards and many other online payment methods. Incorporated in 1999 by Fidelity National Financial, over US$3 billion in transactions have been protected. Escrow.com has over 17 years of operating a licensed, regulated, and regularly audited escrow service. Buyers get to inspect the goods or services before accepting them, protecting the buyer. Likewise sellers are protected from counterparty risk with no chargebacks, ever. Escrow.com is the winner of the 2017 BBB Torch Award for Ethics for Silicon Valley, San Francisco and the Bay Area, an award presented to a business that goes above and beyond in their business dealings with customers, other businesses and the community. Escrow.com is the world’s most secure payments method from a counterparty risk perspective- safeguarding both buyer and seller, all funds transacted using escrow are kept in trust. We engineered our API to let you spend more time running your business and less time worrying about payments code and compliance overhead. Now you can manage your most important transactions without the risk of chargebacks, all with fees lower than credit cards or PayPal. Our step-by-step integration guides, code examples and centralized API reference make it simple to understand and easy to integrate so you spend less time writing code. Time to take control of your roadmap - your integration will work the same as it does today as it will tomorrow. Stay up to date on the progress of each of your transactions through our portal or use our webhooks to get real time granular updates on the progress of each transaction. With a new developer portal, interactive documentation, and real-time dashboards, we are putting developers first. We can’t wait to see what you build! We've made it even easier for you to integrate escrow payments. 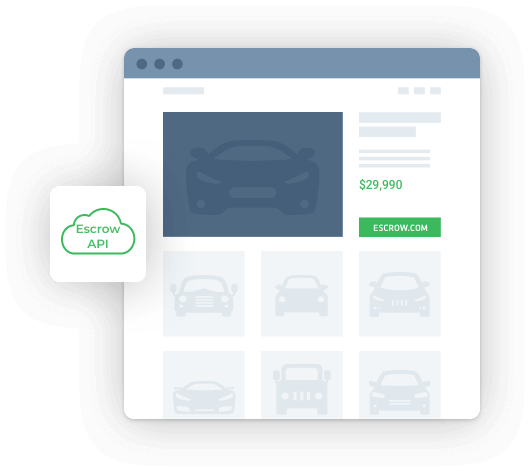 Add Escrow Pay to your business with a single API call. Reduce complicated engineering overheads and improve your sales today. Allow your customers to transact on e-commerce, marketplaces & classifieds sites with higher trust & safety greatly reducing fraud and with no chargebacks, ever. Physical inspection & acceptance happen on delivery, meaning valuable items can ship across state or country lines before the transaction completes, allowing your customers to expand beyond the local area to a global market safely. Greater liquidity means sellers can access more buyers and buyers more sellers, resulting in better choice and pricing and increasing the probability of a successful transaction. Your customers benefit from our world class transaction support. Experienced Escrow.com personnel can check shipping documentation, title, liens, and more. Escrow.com provides “compliance as a service” performing know your customer & anti-money laundering verification. 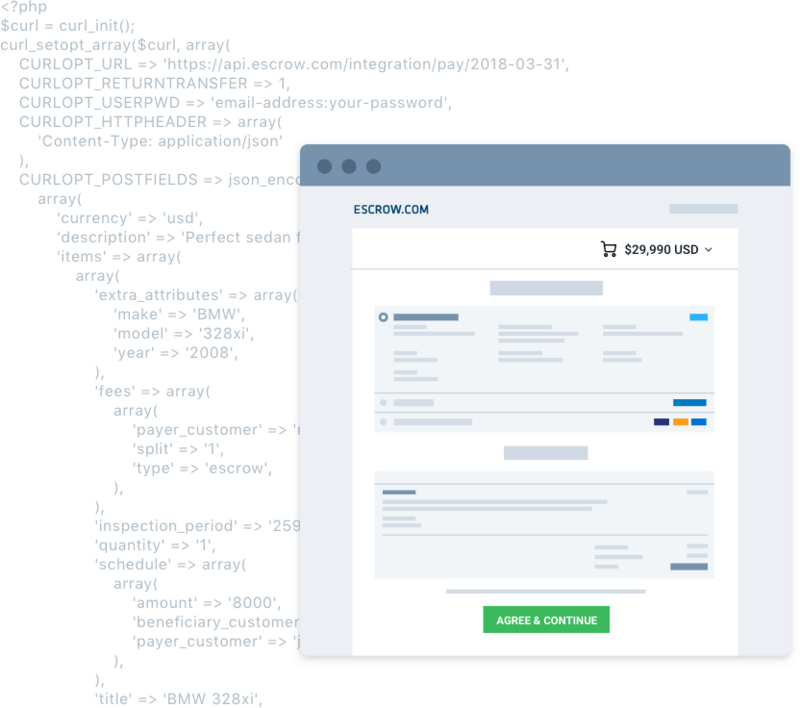 Escrow.com “closes the loop” providing insight into what happens to your customers after they match on your site. Campaigns and ad targeting can run more effectively. Know which listings are up to date and which are expired, creating a more relevant experience for your audience. Revenue share is available for volume partners of $1 million per month or more. Escrow.com is one of the most trusted escrow services in the world, and is the most trusted in the domain name industry. Everybody I know uses them, and I always find their staff to be available, knowledgable and helpful. We have recently added Escrow.com as a partner to protect our community from fraud. Buying and selling used heavy equipment internationally needs a trusted service to guarantee successful completion of the transactions. Escrow.com has developed the safest and most secure environment to eliminate fraud when buying and selling vehicles over the internet. They are a key partner to anyone who values trust and safety in their marketplace.